The BFA in Design and Technology offers a practical foundation in all areas of theatre production, including scenic, lighting, sound, costume and property design, technical direction, and construction. BFA design and tech students receive hands-on opportunities to explore interdisciplinary possibilities; experiment with, and apply new technical and conceptual knowledge; and learn both in the classroom and through production work. Students also enjoy opportunities to work with national and international guest artists, travelling nationally and internationally to attend workshops and exhibit work. 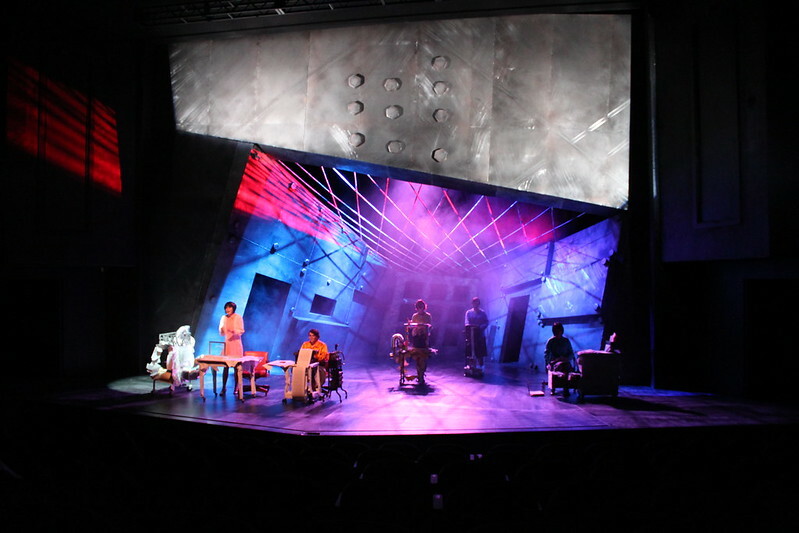 Auburn’s BFA in Design and Technology provides a foundation for a career, not only in theatre, but in related fields such as film, television, and concert tours. Auburn University was honored to be selected as one of the four universities in US to participate at The 2012 International Stage Design Students’ Work Exchange. Our technical program was recently rated in the Top 25 Design and Tech Programs for 2018-19 by OnStage Blog. Click here to find out more! An Auburn theatre education offers many opportunities to learn both in and outside the classroom, and we encourage our students to think locally, nationally and globally, through study abroad, participation in conferences and professional internships. Our technical and design faculty are active in national organizations such as the United States Institute for Theatre Technology (USITT), and international organizations such as World Stage Design (held most recently in Cardiff, Wales), and the world renowned Prague Quadrennial. Our design and technical students also participate in these extraordinary opportunities to learn from and network with internationally recognized theatre artists. Learn more about special opportunities for cultural exchange as well as resources for making national and global connections. A minimum of 120 credit hours of course work must be completed to receive the BFA degree. Students are typically involved in a significant production oriented project during each semester of their residency. A student's progress in both the classroom and the program is carefully monitored by faculty through reviews and evaluations at the end of each semester. Following successful completion of sophomore year portfolio review, students are assigned a design or technical project in conjunction with a studio/main stage show developed in consultation with their advisor. Continuation in the program is contingent on the content and quality of work, as well as the maintenance of a minimally acceptable GPA. See the full curriculum for the BFA in Design and Technology on AU Bulletin. All prospective students enter Auburn University as students in the BA (see Bachelor of Arts in Theatre). Entrance into the BFA Design and Technology program is through portfolio review and interview in the spring of the sophomore year. During the first two years as a theatre major, design tech students build a foundation on which to build through their advanced training as BFA juniors and seniors. The first two years focus on broader-based theatre education as well as practical technical skills, drafting, rendering, scene painting, costume construction, and work on main stage productions. After acceptance into the BFA track, juniors and seniors go on to study more specialized aspects of design and technology, assist faculty and guest artists, as well as work toward a culminating senior project in a specific area of design or technical interest. All candidates for the BFA in Design and Technology program must demonstrate a potential for excellence through a portfolio presentation and interview, hold a minimum of a 2.8 cumulative point-hour ratio in all previous course work, and have successfully completed participation in a minimum of one departmental production. The interview portfolio should include examples of work from realized theatre productions and class projects, samples of research material, organizational paperwork, and visual production documentation. Portfolio may contain sketches, full-colored renderings, drafting, pattern drafts, lighting plots, lighting sections, or design paperwork. Work that demonstrates the candidate’s process as well as the final product is encouraged. In addition to theatre design work, an applicant is encouraged to include any work that demonstrates creativity and design skills such as drawing, photography, sculpture, painting, and collage. During the freshman and sophomore years, faculty mentor prospective BFA students in the development of their portfolios.